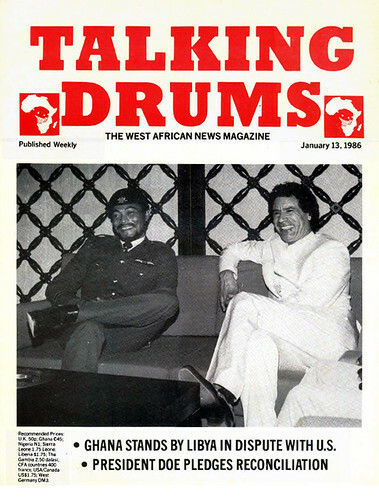 Events are fast outpacing the best laid plans of both dictators and mere toli mongers, thus, although the theme fits the bill, I have had to bring forward the piece I promised almost four years ago as a follow up to the theater of that secret video of Gaddafi that was leaked to me. The current atrocities and low rent circumstances however necessitate light verse, or even doggerel, rather than the intended prose poem. Thus I give you another entry in the Things Fall Apart Series, file this under the banner of Fallen Angels. Inconvenient topics, blood and sin, never to be discussed. He went hunting, or, as his hosts put it, faire la chasse. The customary bodyguards, as always, were close at hand. He'd built up a legacy of blood-soaked sand. The revolutionary principles, however, damned the man. And with translation, worthy of the blandest corporation. You've heard no doubt about the "Third Universal Theory"
And of course "The Solution of the Problem of Democracy"
The generosity of his wisdom, to be shared far and wide. "Crush the dissent", "Don't brook any opposition". Throughout I kept asking myself: why are these men laughing? It was the usual circus, the large retinue come what may. Like a palm tree rising in an oasis surrounded by blight. The other leaders would be shown in their proper pedestrian light. Then emerge seemingly untroubled if not exuberant. Men of will who forced their views on clans and the whole world. The caliber of revolutionary, visionary men on the road to hell. To be studied and internalized, it even dealt with public health! An unbroken chain of leadership, he outlasted Chairman Mao. Who else had such a claim? He even beat Omar Bongo. The real prize, as you know, was to indulge in blood and sin. No, it was only right, he belonged in the history books. In any gathering he would stand out, opinions as sharp as his looks. Distilled them for present and future generations. The Little Green Book, the wisdom for the ages. A guide for the world, a guide for revolutions. Luminous as only the folk wisdom of desert guides could be. Those Swiss bank accounts, how prosaic wouldn't you think? The pages of The Little Green Book were used as toilet paper. The issue was blood and sin. Prosecutor: Was there ideology taught in the camp? Witness: Yes, what we learned in the Mataba was about how to share the wealth of your government - about the distribution of wealth. Prosecutor: This Mataba, did you receive any books or lesson papers in that ideology? Witness: The ideology was taught in Mataba itself. They had a school to learn the ideology. You learned about the Green Book. How governments are cheating other governments. Prosecutor: At what age do you say you were abducted by the RUF? Prosecutor: Had you been to school up to that time? Prosecutor: In what languages were you taught at school? Prosecutor: From what age did you attend school up to the time you were abducted at age 11? Witness: I don't know the age at which I went to school. I don't know the age. Prosecutor: How many years had you been in school by the time you were abducted at age 11? Prosecutor: After you were abducted, at some point you have told us in evidence you had some lessons from the RUF. That's right, isn't it? Prosecutor: Were you at some time made to read passages of Colonel Gaddafi's Little Green Book by the RUF? Witness: The Green Book. They called it the Revolutionary Green Book. 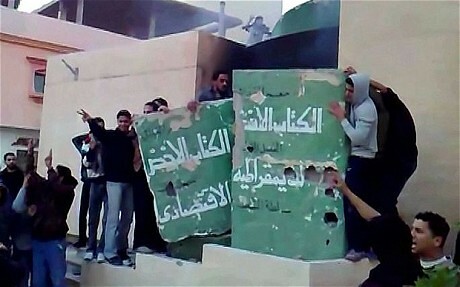 They said it was from Libya, from Mohamed Gaddafi. Yes, I read that one. Witness: In English. Everything was in English. Prosecutor: So you speak good English, do you? Witness: The English that I can speak is what I am speaking here. I don't have any other English. As you hear me speaking I don't have it above that and I don't have it below that. That is what I am speaking here. Prosecutor: So, what was taught in English apart from the Green Book? Witness: The Green Book when they read it they would read it in English and they would interpret it, because there were people who did not understand English and so they would interpret it into Krio to them, but some of us who were able to read a little bit when they spoke the English we would understand. That was why I said everything was in English. [Moses] Blah testified about the first time he met [Charles] Taylor during his military training in Ouagadougou, Burkina Faso, and Tripoli, Libya. 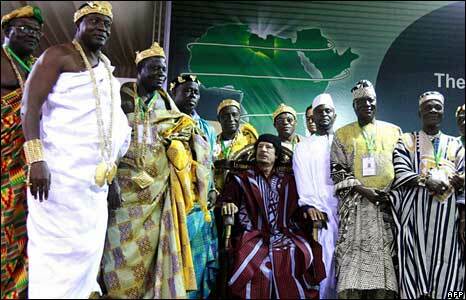 In Libya, he trained with a group of Gambians, as well as a group of Sierra Leoneans led by Foday Sankoh. Blah testified that Sankoh referred to Taylor as "chief." Blah recounted that the first time he saw Taylor, Taylor introduced himself as "chief" and named the soldiers the National Patriotic Front of Liberia. Taylor also appointed Blah as Adjutant General of the NPFL. After listening to 91 prosecution witnesses over the past 18 months, Taylor said people had referred to his forces as if they "were brutes and savages: We are not. I am not." Still, the former president acknowledged that skulls of Liberian soldiers were displayed at strategic roadblocks in 1990. "They were enemy skulls and we didn’t think that symbol was anything wrong," he said. "I did not consider it bad judgment. I did not order them removed." Taylor, who earned an economics degree at Bentley College (now University) in Waltham, said he had seen images of skulls used in many "fraternal organizations" and Western universities. He also acknowledged that atrocities were committed in Liberia by "bad apples" and renegade soldiers, but said he had taught his small band of rebels - from their initial training in Libya - to abide by the laws of war. "We found out that they were taking place, and we acted to bring those responsible to justice," he said. Rebel soldiers who committed excesses were court-martialed and sometimes executed, but civilian judicial institutions were left in place in areas under rebel control, he said. He of The Little Green Book and his brothers in blood will not be missed.